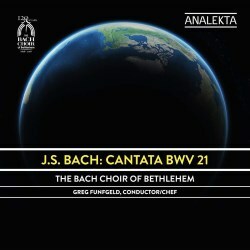 To celebrate their 120th birthday, the Bach Choir of Bethlehem – which proudly boasts that it is “The Oldest Bach Choir in the United States” – has released this CD of a complete Bach cantata framed by a couple of arias from other cantatas. This is a performance which can be characterised as comfortable, relaxed and affectionate. Here are musicians who clearly enjoy performing Bach for its own sake, and do it with a kind of natural ease which is immediately satisfying, even if it imposes no significant interpretative personality on the music nor reveals any real sense of engagement with the spirit of the text. While some of the major Bach cantata cycles and one-off recordings delve into matters of historical performance practice, sacred contextualising and textural authenticity, here is one which is content merely to let the performers’ familiarity with the musical style carry the burden of communication. At times I find it perhaps a little too laid back and self-satisfied, but on the whole I find nothing objectionable or even contentious here, and often the performance reveals some enticing qualities – as in the unforced projection of the chorale melody by the tenors and basses, subsequently taken up by the trombones in the chorus “Sei nun wieder zufrieden, meine Seele”, and Loretta O’Sullivan’s sprightly cello, Charlotte Mattax Moersch’s effervescent organ and Benjamin Butterfield’s vivacious singing in the aria “Erfreue dich, Seele, erfreue dich, Herz”. The two framing arias share an atmosphere of calm and unruffled ease. The first is a soprano aria from Cantata 120 sung with a disarming, almost bird-like purity of tone and airiness of articulation by one of the two named sopranos on the disc’s cover. But whether it is Cassandra Lemoine or Rosa Lamoreaux I really cannot say; the booklet does not divulge which soprano is singing here, and I am not well enough acquainted with these two voices two know which is which. Whoever, then, is singing here, is a delight to the ear and with the Bach Festival Orchestra’s tastefully buoyant support and Greg Funfgeld’s delicate treading over stylistic issues, this makes for a truly enticing opener. Daniel Taylor is the soloist in the concluding aria, taken from Cantata 76, and his performance is a model of grace and elegance, superbly blending into the obbligato oboe line and projecting a tone of exquisite poise and consummate control. It is after all, as Robin A. Leaver’s informative notes tell us, “an intimate love song”, and with the touching support of oboe d’amore, viola da gamba and continue, it makes a most affecting end to this disc. The main purpose of this quite short disc, however, is to present Cantata 21 in its entirety. We read that it was written “for various occasions between 1713 and 1714”, at each performance evolving a little more, and opens with a Sinfonia, its steady tread, nicely held in check by Funfgeld, allows the interweaving violin and oboe parts to unfold fully, and the periodic interruptions to the flow to assume their full impact. The fugal choral entry is derived, it would seem, from the Vivaldi D Minor Concerto which Bach had, around the same time, transcribed for organ. Contrapuntal complexities are underplayed in a piece of choral singing which, even when the music breaks into a brisk allegro, exudes calm and repose. In a way, this fondness for an unruffled surface which informs the entire performance, creates a slight feeling that elegance of tone and smoothness of line take precedence over everything else. The soprano who sings the first solo aria in this Cantata immediately impresses with her impeccable pitching of the high first note and the unaffected focus of her voice, and the discrete, beautifully manicured support from oboe and continuo helps to set that quality off to perfection. A recitative and aria from the tenor, Benjamin Butterfield, introduces a touch of dramatic fervour to the proceedings, and while he seems awkwardly reserved in the recitative (one feels almost that Wagner is vying for our attention here), the tense atmosphere which pervades this seems quite suited to a text which talks of floods of salty tears and stormy seas threatening to break the mast, dislodge the anchor and send the singer down to the abyss. The booklet does not provide either original text or any indication as to the spirit of the words. The calming words of Jesus, presented in the Cantata’s second half, are sung by William Sharp whose light baritone is perhaps not the steady, solid presence we might expect, but with his superb diction and careful rhythmic articulation, is the perfect duet partner for the soprano in the three duet numbers. The festive character of the concluding chorus is magnificently evoked, not so much by the presence of trumpets and drums as through the fluttering choral parts which positively fizz along.